Update for 2019: Promasoft Autoresponder software is no longer available. We recommend trying Getresponse instead. Click here for information about Getresponse! Pros: You only have to pay once, and the cheapest version is less than many year long subscriptions for web based services. Allows the creation of filters which will automatically send out user prepared letters to various types of messages, with no need for supervision.. As opposed to previous versions of the same software, no full time internet access is necessary. You can try the fully functional copy for thirty days before purchasing registration codes. Cons: As a windows based program, this runs on your computer, taking up space and processing speed. Unlike web-based or script-based services, it only checks e-mail as often as you schedule it to do so, not instantly (similar to e-mail program such as Outlook). Price is in Euros, but they use PayPal so you can pay through any currency PayPal supports, including the dollar. There are also discounted upgrade prices available, if you misjudged your needs. Professional Edition, and the Enterprise Edition allows usage of software on any number of (your) computers. All versions allow ad free messages — that is even with the Personal edition, all of the emails that the program sends are ad free. This makes the Personal Edition a great deal for the price! Lite Edition doesn’t contain many of the features which are present in all other versions of the program. Specific features available in each version can be viewed here. 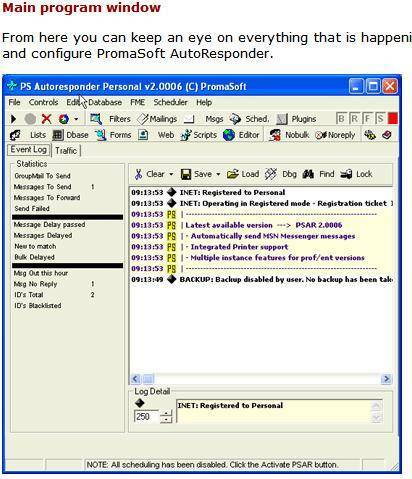 PromaSoft AutoResponder is a windows based autoresponder. It requires a computer to constantly run itself. The price above is only paid once. The following is a list of features provided by the official PromaSoft AutoResponder web site. PSAR most important feature — you can define as many auto responders as you want. Each of these auto responders can be triggered depending on certain keywords (with wildcard support) in various regions of the received email but you can also use advanced formulas where you can decide to act on a message depending on more complex criteria. These advanced formulas support VBScript. PSAR allows the user to reply using the HTML format and also to send group mailings in the HTML format without leaving PSAR using the built in wysiwyg HTML editor. PSAR can act as a mail server whereby it will directly send outgoing mail to the SMTP server of the recipients. Create of as many group mailing setups as you want with as many follow up letters as you want. Send out a series of different emails on a predefined interval. using the scheduler you can schedule your mailings and newsletters to go out whenever you want. This includes scheduling options for the follow up threads. Now you can use PSAR in automatic mode using your normal dial-up connection. You no longer need full-time access to the internet. PSAR will automatically connect, retrieve your mail, reply to it and disconnect at predefined intervals. The possibility to use as many attachments as you want in the group mailings and follow-up letters. You can specify a specific return address per defined filter. This allows you to employ PSAR for different persons in your organization as if you would run multiple copies of PSAR. you can have PSAR reply to either the from, return-path or reply-to headers of incoming email or to the 1st or 2nd email ID in the body of the email. forwarding to multiple recipients instead of only one. Forwarding to one of your mailing lists enabling to run your own own list server. Forwarding to a log file. PSAR supports receiving and sending mail with foreign characters. An often disregarded option. you can create filters using complicated rules containing Boolean operators like AND, OR, NOT plus the use of wildcards and VBScript functions. use wildcard characters in the matching criteria fields. use your form databases as source for mailings making the loop from web form to end user completely automatic. PromaSoft Autoresponder is able to handle an unlimited amount of your POP accounts. Each of these POP accounts can have as many aliases as you want. Create your mail merging files with as many fields as you want and use them to do your personalized scheduled group mailings and/or newsletters. Use mail merge files from virtually any other database or office application using the popular CSV format. You could even create them manually. Also use the database files created by the PS Autoresponder form handler. Forward your received email to any address you like. Every filter can have a different forwarding address. Forward left over email (not trapped by any of your other filters) to a low traffic email address so you can read what is important. Define your own keywords to be used in your mailings, newsletters and filter definitions. These keywords are replaced with the text you specified before at the time they leave PS Autoresponder. For instance put $signature$ in all you mailing definitions. Any time you change the keyword definition all your mailings will have the new signature. These keywords can even hold complete texts. Everyone knows that it is important to know which target audience you are reaching. To help you to do this PS Autoresponder will include even more statistics. PS Autoresponder will perform ALL operations totally automatic. These operations include: auto responding, sending out mailings and sending out newsletters. You could leave PS Autoresponder to run for days. 24 by 24 and 7 by 7. Note: PromaSoft condemns all use of of the application as a means to Spam. Create as many filters as you like. These filters are used to recognize certain types of email that come in and give an appropriate reply to them or simply trash them. You might want to choose not to respond immediately to an incoming mail but wait for 1 hour or even 2 or 3 days. You can specify this setting on each filter separately. PS Autoresponder can run totally unattended and independent from you normal email application. If you make use of the forwarding functions you can for instance pass left over mail to another email account read by a human. This way you don’t need to worry about filtered out email. Daily statistics are kept so you can see how many message are being received, replied to and deleted from your mail server. You will even see who has sent how many messages to you and how many times your have replied to that person. You can see how many times a certain filter has matched a message. PS Autoresponder will maintain a list of all email ID’s you have ever received mail from or replied to. This list is used to keep track of the people you have communicated with and also flags them if they want to be excluded from further replies and mailings. Next to this there are import and export functions. This will allow you to send newsletters at predefined times to predefined email lists. This also includes methods for people to subscribe to your newsletters via normal email or via your website. PS Autoresponder also enables you to send out a series of newsletters newsletter when people subscribe to it. You can offer the people you reply to an option to remove themselves from you responder. That way they will not receive any more messages from you. Next to this global remove option there are of course also options to let people remove them selves to a specified email list. The program is friendly to your POP server meaning that it has the option to delete messages when they have been replied to. You never worry about a full inbox anymore. Several keywords are defined to include parts of the original message in your reply, such as subject, name, body etc. Next to the reserved keywords you also can create your own. this parameters allows to specify how much of the original message needs to be included in the reply. the $name$ keyword is replaced with the name of the sender when sending replies. The $to$ keyword is replaced with the recipients email address. The $hits$ keyword is replaced with the number of times a certain filter has been hit. PSAR offers the possibility to execute an external program on reception of a matched email. PSAR can feed information out of the email into the external program and merge the output of the external program into your replies. This is very usefull for automatic code generation and more. PSAR can be instructed to play a sound file (wav,mid,rmi) uppon reception of an email. Never let that important email go unnoticed. Each filter can have it’s own sounds.